The Old Foodie: Walthamstow Wine. Wine from Walthamstow was enjoyed by Samuel Pepys on this day in 1667 – that is, wine from grapes grown a mere 6.4 miles from Charing Cross. At that time Walthamstow was “the country”, where the wealthy such as Sir William had their country estates, and popular hobby of noblemen was grape-growing and experimenting with wine-making. At the time of the Domesday survey in 1086 there were 40-something vineyards listed in southern England, although in reality there were probably more. Various reasons are given for the decline –the dissolution of the monasteries by Henry VIII (most of the wine being made by monks), the introduction of tea and coffee - and climate change (the weather was warmer in England a few centuries ago). Perhaps global warming is helping with the resurgence of interest in the production of wine in England over the last few decades- there is no doubt that it is happening, and some of the wines are doing very well in blind tastings alongside those from more traditional grape-growing areas of Europe. 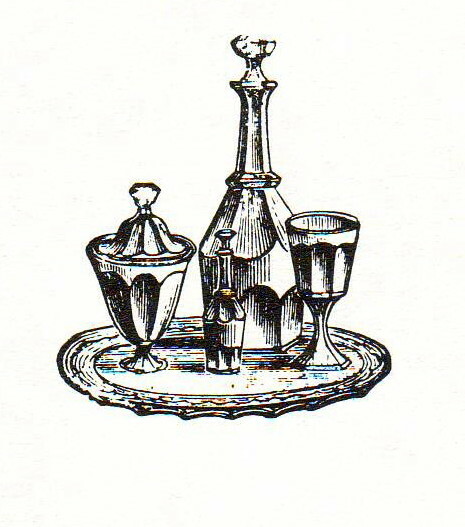 The Countess of Newport’s Cherry Wine. Pick the best Cherries free from rotten, and pick the stalk from them; put them into an earthen Pan. Bruise them, by griping and straining them in your hands, and let them stand all night; on the next day strain them out (through a Napkin; which if it be a course and thin one, let the juyce run through a Hippocras or gelly bag, upon a pound of fine pure Sugar in powder, to every Gallon of juyce) and to every gallon put a pound of Sugar, and put it into a vessel. Be sure your vessel be full, or your wine will be spoiled; you must let it stand a month before you bottle it; and in every bottle you must put a lump (a piece as big as a Nutmeg) of Sugar. The vessel must not be stopt until it hath done working. Or any other reason why. I don't think the English have ever stopped making wine from whatever. When I was growing up, all the neigbours were forever making elderberry wine! great post, I love the history lessons! One of my old aunties used to make it too - but she made wine from everything, but didn't drink herself. Never did figure that one out. Hello Sally - I hope you looked at the strawberry wine recipe in the archive too. How about potato wine and pea-pod wine? bet they tasted like crap too! For those of Moderate Income. St James (the Great) Day. The proper appreciation of sparrows. A pretext for a good dinner. The Prince in the Colonies. Biscuits, puddings, and Protestant eggs. The poet of bran and pumpkins. The End of the Auk. Extra! Extra! Maple Syrup and Canada Day.